Huntington Street, which is overshadowed by an elevated line, similar to Hove Beach's Mohawk Avenue, is the main thoroughfare of Cerveza Heights, cutting across the heart of the area. Cerveza Heights is a neighborhood in central Dukes. It is bordered to the northeast by Charleston Avenue (Meadows Park); Livingston Street and Hoober Street to the northwest (East Island City); Stone Street and Valley Forge Avenue to the west (BOABO); Brunner Street to the southwest (Downtown); Thornton Street to the south (Schottler); and Carson Street and Stillwater Avenue to the southeast (Meadow Hills and Beechwood City). Cerveza Heights is based on the New York City neighborhoods of Jackson Heights, Flushing, and Corona (incidentally cerveza is the Spanish word for beer and Corona is the name of a famous Mexican beer) in Queens. Like it's real life counterparts Cerveza Heights is ethnically diverse with notable Chinese, South Asian, Italian, and Latino communities. It serves as the Spanish Lords' base of operations in the Dukes and Broker area. Members of the Mafia can be seen hanging outside the Cluckin' Bell. These are presumably members of the Messina Family since they are the Mafia controlling Dukes. In GTA IV, a hospital is located in the neighborhood at the intersection of Inchon Avenue and Livingston Street, with a Cluckin' Bell fast food restuarant a block south at the intersection of Inchon Avenue and Huntington Street. A Manana is wanted for the Stevie's Car Thefts which can be found on Huntington Street in Cerveza Heights. Farther down east on Huntington Street, is the closed Burger Shot. 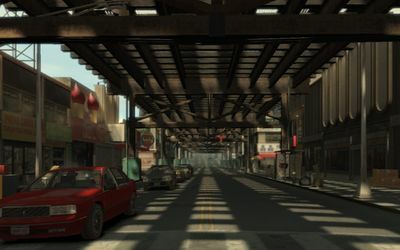 In Grand Theft Auto: Chinatown Wars, Sum Yung Gai (which is also featured in GTA IV), serves as the first point where the player performs missions; the first safehouse where Huang Lee stays is also located in Cerveza Heights, a short walk north from Sum Yung Gai. The building on the west side of the neighborhood, next to Dukes Boulevard, has heavy amount of graffiti. Some of the graffiti are from game arts from Grand Theft Auto III and Grand Theft Auto: Vice City. Artworks from GTA III include 8-Ball, Misty, El Burro, a Diablos emblem, and a Yardie gang member, and artworks from GTA Vice City include a motorcycle. The Liberty City Subway has a stop at the intersection of Charleston Avenue and Huntington Street. It is served at all times by the Broker Line. This page was last modified on 27 April 2012, at 21:31.